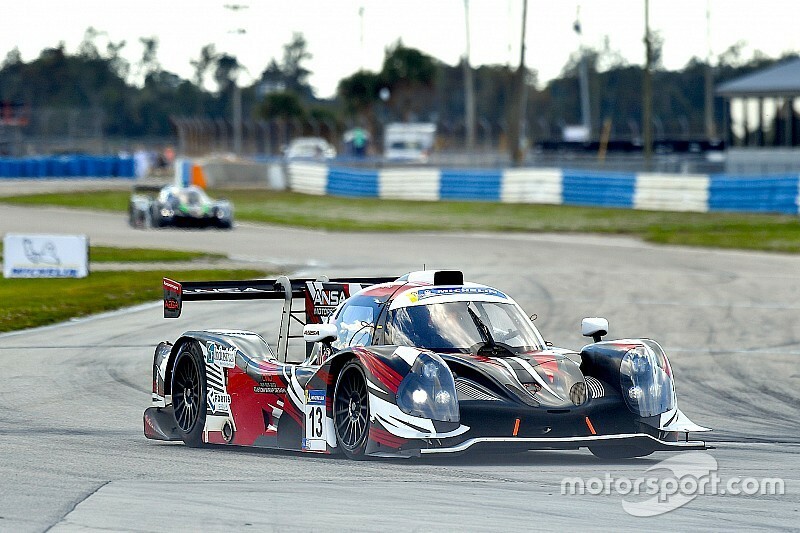 Relentless pace and consistency from sportscar newbie Kyle Kirkwood in the second half of the four-hour IMSA Michelin SportsCar Encore at Sebring proved crucial in ANSA Motorsports’ victory over K2R Motorsports. A late yellow flag bunched the field, allowing K2R’s Matt Bell to move the polesitting K2R Ligier JSP3 onto the tail of Kirkwood’s similar car, but although he kept up the pressure in the 26min shootout to the checkered flag, Bell didn’t quite have an answer for the reigning USF2000 champion’s pace and race smarts. Kirkwood, in the car he shared with Roman De Angelis, crossed the finish line 2.3sec ahead of the Bell/Kay van Berlo/Jim McGuire machine. Almost 20sec back, there was even closer battle for third between Polestar and Simraceway as Katherine Legge and Nicolas Rondet clashed with four minutes to go. Rondet tried a late and optimistic move down the inside of Legge which he realized wasn’t going to work and had to spin to avoid a harder impact with the Polestar machine which Legge shared with David and Keith Grant. Rondet took fourth. A lap down, Alexandre Barron and Naveen Rao took fifth in the second K2R car, ahead of Guy Cosmo and Pat Byrne in the JDC Motorsports entry. P1 Motorsports had an unlucky day, with Jonatan Jorge incurring a penalty for an improper wave-around procedure that ultimately dropped the team two laps down. Co-driver Kenton Koch then performed well to keep pace with the Kirkwood vs. Bell battle, but with 40mins to go suffered an accident at Turn 1. In GT4, Dean Martin, Nate Stacy and Kyle Marcelli drove their Roush Performance/ Kohr Motorsports Ford Mustang to victory ahead of the GMG Racing Audi R8 James Sofronas and Andy Lally. The leader suffered a pitlane miscue that required an extra stop for more fuel, while Lally made a late stop under yellow to try and tackle the Mustang with a fresh set of tires but he came up 16sec short. In TCR, on the penultimate lap Remo Ruscitti, sharing with Marco Cirone, moved his Mark Motors Racing Audi RS3 past the similar JDC Motorsports Audi of Stephen Simpson and Michael Johnson to clinch victory.